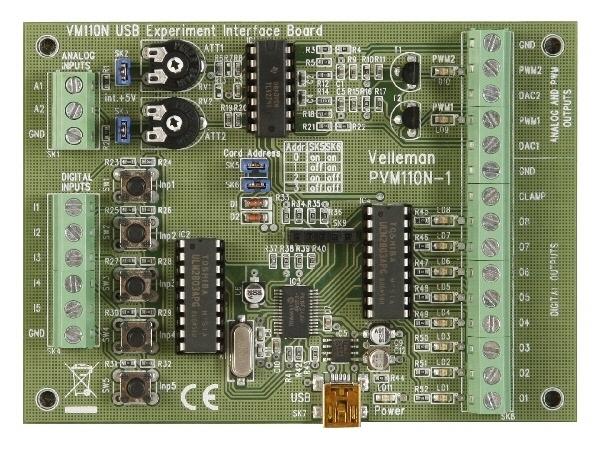 The VM110N interface board has 5 digital input channels and 8 digital output channels. In addition, there are two analogue inputs and two analogue outputs with 8 bit resolution. The number of inputs/outputs can be further expanded by connecting more (up to a maximum of four) cards to the PC's USB connectors. All communication routines are contained in a Dynamic Link Library (DLL) K8055D.DLL. You may write custom Windows (2000, XP, Vista, Windows 7) applications in Delphi, Visual Basic, C++ Builder or any other 32-bit Windows application development tool that supports calls to a DLL. Source code for Visual Basic , Visual C++, Visual C#, Excel, Delphi and Borland C++ Builder included. iPhone application for K8055, K8055N (kit) or VM110, VM110N (assembled) USB Experiment Interface Board. From now on your can control all your home applications from anywhere you can access the Internet on your iPhone. No network configuration is required !